You stand in a dimly-lit gaming arcade, surrounded by beeping, buzzing old-style video game machines. Welcome to the Yestercade! If you came here for the Federation Standard Tri-D Chess Rules, use the control button to the left to beam forward to their homepage. My voice acting site may be reached by clicking on the noseglasses button, and you should check out the music of Bjorn A. Lynne, who kindly lent his musical talents to my demos. If you are looking for the Latest Best Arcade Machine I've Rebuilt, then click on the button to the left to see my classic Space Invaders machine. 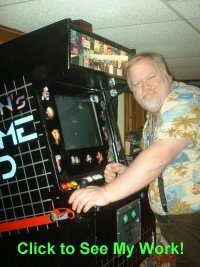 Clicking on My Smiling Face to the right will show you the arcade machines I have rebuilt so far. And if you just what to know about owning your own arcade machine, let me tell you right here about having a Yestercade, and why you can’t possibly live without one! At one time in the distant past, they arose. They began in ones and twos, scattered around familiar human watering holes. Their bright plumage and shill calls attracted their followers, and we learned how to feed them. They were like nothing we had ever seen, and in those days, we watched them and were glad. Before long, they were everywhere. Wherever humans gathered, the glassy-eyed brought them coins as tribute. It was a Golden Age that would surely last forever! But then came faster and brighter creatures: The Atari 2600, Intellivision, and Colicovision roared to life, and after that the lofty Nintendo. One by one, the old giants dropped away into leaky warehouses, second-string amusement parks, and the occasional corner laundromat. High-powered console games banished all but a few of the old warhorses. Massive memory, fancy 3-D graphics, and a thing called the Internet killed them dead. Their plaintive call was gone, and all was darkness. But I remember them. The first PacMan landed in my college dorm in 1982, and from there I went on to the hard stuff…BattleZone, Crystal Castles, Mappy and others. Is there no justice that these classics should pass away? The Yestercade is my attempt at saving a little bit of the past. I can take a classic empty arcade box, one that was actually played by folks like us twenty-five or so years ago, and bring it back to life. With a used PC, a monitor and some clever engineering, that box rises again, playing lots of those classic games we remember so well. A museum you can touch, it can sit in your basement and bring back those glory days. Show your kids what real games were like! And custom artwork to personalize the Yestercade as YOURS! A Yestercade box takes about two months of my spare time, and utilizes hardware I usually have on hand. The actual case theme depends on what I can find; my RallyX was in such good condition that I actually refinished it back to what it was, while sometimes I make a recognizable name-brand case from a more generic original. Some I have personalized to the owner, like the DaleCade. I’ve also done some low-end machines I have donated to church youth groups. An original arcade game playing a single classic game may go on Ebay for $1000 or more. I have often bartered these cases for things I want. (I would love to recarpet my house, or replace my garage door, or have an expert retile my kitchen floor…ask about it!) Every one is a unique challenge, mixing engineering, carpentry, art design, and gadgeteering. Contact me and bring back the thrill of that corner arcade, right there in your own home! I've built nine machines so far, counting my handmade case, TRON's Game Grid. Click on my picture at the top of the page and check them out. And hey, if you decide one would look good in YOUR basement or gameroom, contact me! Because these works of art are built largely with “on-hand” computer parts, if you have old equipment, I am always interested in cast-offs. PC boxes and 17” and larger monitors given to me will spare them from poisoning a landfill, and if you are looking to have a Yestercade of your own, good second hand stuff lowers the real cost of building it. You are gamer Number to drop by the Yestercade. The Yestercade is open all night, but I'm not: Email me by clicking on the OPEN sign.